Janet McNally Reed had been given a temporary job as pastoral assistant at St Ignatius of Loyala (St Iggy's) Catholic Church at College Station in Texas. She had to administer the parish while the priest was away. Her husband had died of a heart attack five years before. Then two years previously, her son Sammy had been killed in a car crash caused by a poilice driver who, when pursuing a speeder, had ignored a stop sign. Mary had filed a lawsuit against the police and set up a trust fund with the money so obtained. Although a convinced Catholic ("The experience of peace and unity with God when I received communion convinced me that something supernatural was going on "), she admits, "I'm still a bit pissed at God myself". As she is the narrator throughout, we are told very little about her appearance except that, "While I always tried to keep a bit of lipstick on my lips, and my weight and the roots of my chemically enhanced brown hair in check, I didn't spend much time on my personal appearance." 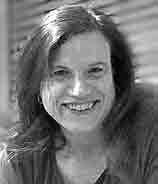 Mary Carroll Patrick is employed in the religious communication field as a writer and journalist, and lives in Texas with her husband and children. And that is all she says about herself. I would welcome more information via my guestbook. 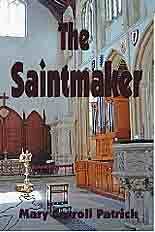 The Saintmaker (reviewed below) was her first novel, and was self-published on Kindle. The Saintmaker is Janet Reed herself, who finds the body of Jim Graham (who, she knew, had been preparing to join the church) in the church chapel and promptly baptises him, in case he is still alive. Her hopes for peace and healing in her new job as a temporary church administrator are dashed when the death turns out to be murder. Then, an apparently miraculous healing of a little girl with cancer (that amazes even her best friend, an atheist woman doctor) occurs and a prayer group in the church decide it must be because the dead man had been a a saint! But Janet knows better. Other complications ensue. The church background, and the very considerable powers given to at least this pastoral assistant, are convincingly described, although it stretches credibility the way that the priest, Father Alex, is allowed to stay away while chaos and destruction threaten his church. and it seems unlikely that any pastoral assistant could demand, "What I say goes" - even if the priest is absent. But I am quite prepared to believe such other parish matters as that "drinking the wine was a universal experience of altar boys" and that there were "mounds of paperwork needed to run a parish". In fact, all this background detail proves surprisingly interesting, although the murder plot itself seems more than a little strained. However, characters like the rather pompous young seminarian, strong in theology but with, at first, little understanding of the compassionate qualities needed in parish life, really come to life. As does the dying black woman whose "appearance suggested joy and life" and "was the last person in a crowd suspected of dying from cancer". It is she who keeps her newly ordered coffin in her living room and tells Janet, "I checked out what the local funeral homes were charging. It's a sin! I got on the internet and found a few places that will ship you coffins. You save a lot that way, but it was still too much." Janet proves to be a resourceful character, quite prepared to stand up to the less than friendly police who suspect, quite rightly, that she is keeping important information from them. She virtually runs the parish with guest priests just popping in to take Mass, and she does not hesitate to give instructions to all and sundry. In the story, Janet explains, "Facing death, even somebody else's, helped me to focus on what was really important in life. Every day is a gift, and we aren't even guaranteed we'll see the sun go down." The author explains that, "If I have written at all well about loss, it is because I have experienced it by losing my mother and father in this life way too soon." And it is these moments of care and compassion that bring the book to life, enlivening the unlikely murder plot and its rather melodramatic conclusion. The author has her own website. Apart from this, there is hardly anything about her on the web. The lettering on the Kindle cover gets a bit lost in the background.